Are You A Smart Landlord ? Do your newspaper adverts get people interested in your properties ? Writing advertising to get people interested in your property with a newspaper classified ad is difficult at times. If your a smart landlord there's a way to make up for those moments when your running short on time, advertising space and ideas. SeeItOnTheNet can help your ad stand out! What we offer comes in the form of an easy to remember web site, SeeItOnTheNet, where you can list all your properties on SeeItOnTheNet for free and get all your properties sent to the big search engines like Google, Yahoo!, Bing, and Ask for including in their search index so people searching them can find you. 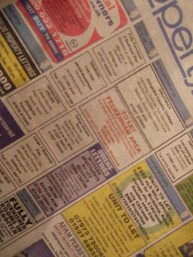 Then to get your newspaper ads working you just add the website name seeitonthenet.co.uk (with or without the www.) to your newspaper ads to give all your future tenants the ability to visit and see all the properties your letting in a private listing of just your ads. SeeItOnTheNet is a great way for a smart landlord to get your properties online for free !